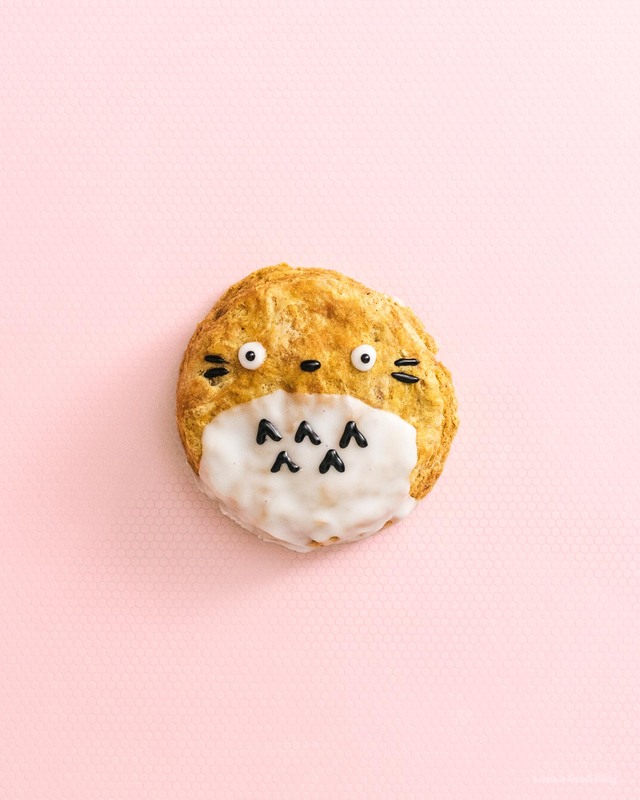 These Starbucks copycat pumpkin scones have been decorated like Totoro for an extra bit of cute this halloween. Pumpkin and Totoros, can life get any better!? Happy Halloween! Are you guys celebrating? Mike and I aren’t planning on doing anything really, but we might wander around the neighborhood in hopes of seeing some costumes. We can’t give out candy because we live in an apartment, but I bought a bag of fun sized treats just in case. To be honest, I love Halloween, but really only a certain type of Halloween. Not the scary one with horror movies and gore and spooky things. Nope, I pretty much like kid halloween: candy and cute costumes and good old fashioned fun. 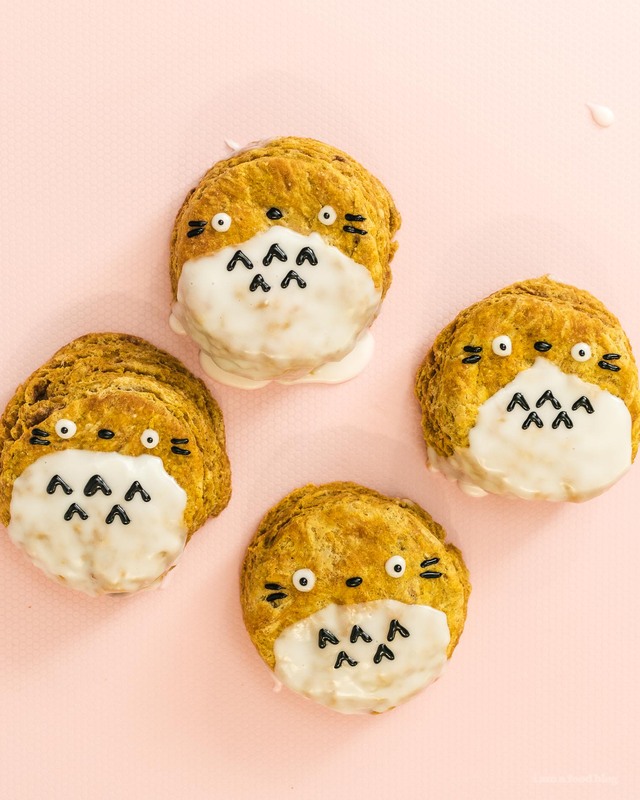 Speaking of good old fashioned fun and cute, these Totoro pumpkin scones fit the bill! They were super easy to make and even easier to eat. Whenever pumpkin season rolls around I want to make all the pumpkin things, but this is actually the first (and it’s not going to be the last) pumpkin thing I’ve made this year. Unbelievable! Wait. No, I lied. I made pumpkin queso. I take it back. This is the first sweet pumpkin thing I’ve made this year. Anyway, I knew I wanted to make a pumpkin scone just like the pumpkin scones at a certain coffee shop that I go to way too often. It’s so weird because there are so many cool coffee shops around us, as well as really nice bakeries, but there’s just something about Starbucks that reminds me of when I was young and spent countless afternoons studying with coffee and a treat. 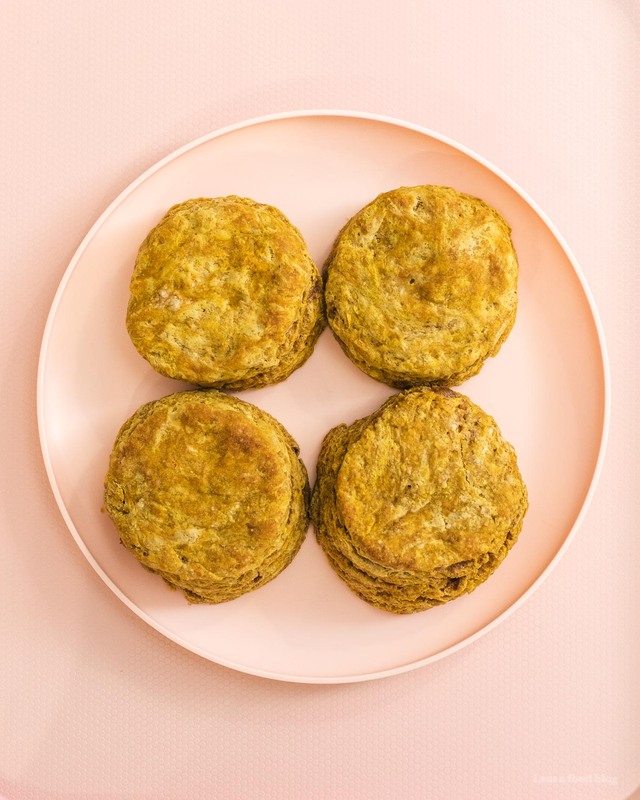 These pumpkin scones are a pretty standard recipe: mix together your dry ingredients, then add your very cold (or frozen butter), then the wet ingredients. I always like grating butter for biscuits and scones because it gets the butter into nice even pieces. As for the pumpkin in this recipe, it is mixed in with the wet ingredients. I used canned pumpkin because, well, sometimes canned pumpkin is better – especially if it’s organic and it’s the only thing in the can. 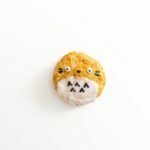 If I had the time I probably would have roasted off and mashed some kabocha to give these guys a Japanese twist to go with the Totoro theme, but in the end convenience prevailed. Anyway, hope you guys have a Happy Halloween full of treats and no tricks! Heat the oven to 400°F and line a baking sheet with parchment paper. In a large bowl, mix together the flour, brown sugar, cinnamon, baking powder, baking soda, ginger, nutmeg, and salt. On the large holes of a box grater, grate the butter into small pieces. Mix into the flour mixture. Place in the fridge. In a small bowl or liquid measuring cup, whisk together the pumpkin, milk, egg, and vanilla. Slowly add the pumpkin mixture, mixing in with a rubber spatula or wooden spoon until a soft dough forms. 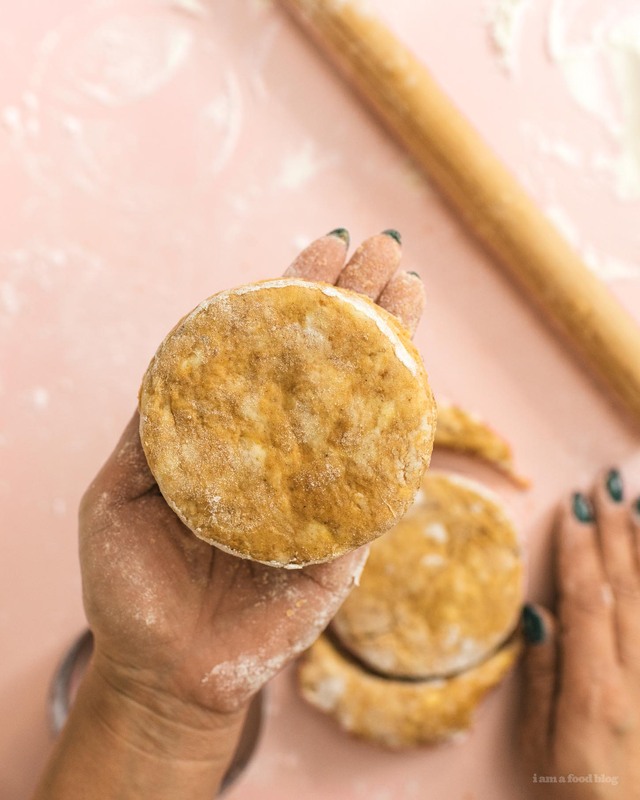 Turn onto a lightly floured surface and fold and pat down until the dough comes together in a circle or rectangle, about 1 1/4 inch thick. Cut into scones using a round cookie cutter and transfer to the prepared baking sheet. Bake for 12-18 minutes (depending on size). Remove from the oven and let cool. Make the glaze: stir together 1 tablespoon of milk with the icing sugar. If too thick, slowly add the remaining tablespoon of milk. When smooth and the scones are cool, glaze. 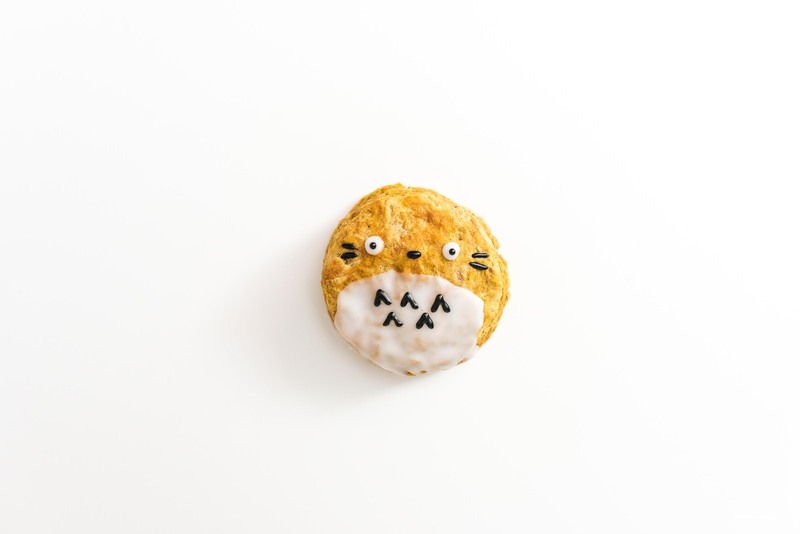 To make a Totoro, spread out a half circle on the bottom of your scone. Pipe out two eyeball whites. Repeat for all of the scones. Dye the remaining glaze black and pipe on eyeballs, a nose, whiskers, and chest furries. These look amazing – although I must admit – anything Totoro and I’m like – WOO! !